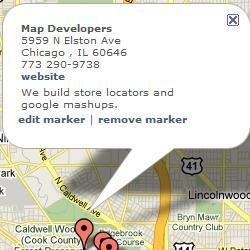 This store locator contains some points of interest in Chicago. After installation it would take you about 10 minutes to create a store locator like this..
Let us create a custom google maps mashup for you. Go to the contact us page and send us your mashup idea.